On one beautiful morning, after landing in India’s most beautiful airport – Indira Gandhi International, we were picked up by our tour chauffeur/guide- Madan who is friendly already. Just because tours in India thru agencies are easy and well recommended to save time and money in a way. After quick greetings and refreshments, we were on our way to The Taj Mahal, the place we been dreaming to visit forever or after Aishwarya Rai took an iconic photo of her. Aish has tremendous influence on my childhood dreams I think 😁 Journey was amazing with green fields, big roads, less traffic unlike other places in India and some dreaming. Soon we arrived in Agra with no sight of Taj (so driver explains Agra is just not Taj😜) and we were placed in a comfortable hotel and its time to get ready for some gorgeous views of Taj Mahal. We had our lunch in a Dhabha nearby, some paranthas and Mughal famous(so called) green spicy sabzi. As soon as we proceeded to experience one of the seven wonders of the world, we were hooked up with a local guide to explain the history of the place. Better than Slumdog Millionaire guide really. We entered thru East Gate and the wall itself is so amazing and high that we could barely see Finial at the top of the ivory white architecture wonder. We couldn’t resist anymore and entered thru gate and shocked to see thousands of people even on a regular weekday. But then yes above all, the tall white structure standing at a distance radiating with sun is a moment that our hearts will be filled with love, our mouths will be awww-stuck and eyes feast with happiness. We have applauded and admired the beautiful structure for few more hours until dusk appreciating it’s beauty at every angle. It is definitely one of the greatest architecture of the modern world and the effort more than 10,000 humans left for the love of their King is beyond imagination. Workmanship those days is unquestionably impressive. As most of all know, it is the tomb of the King Shah Jahan’s dearest wife – Mumtaz Mahal. The structure is built with white marble embedded with rich precious stones completed with large dome which displays great Persian and Muslim art work. The exterior and interior decorations with gem stones, white panels, flowers and fruit art all along, four minarets, gold finial, and thousand others add to the list of the reasons this gigantic structure being the UNESCO world heritage site. It is by all odds one extraordinary construction to experience the ancient Indian history. 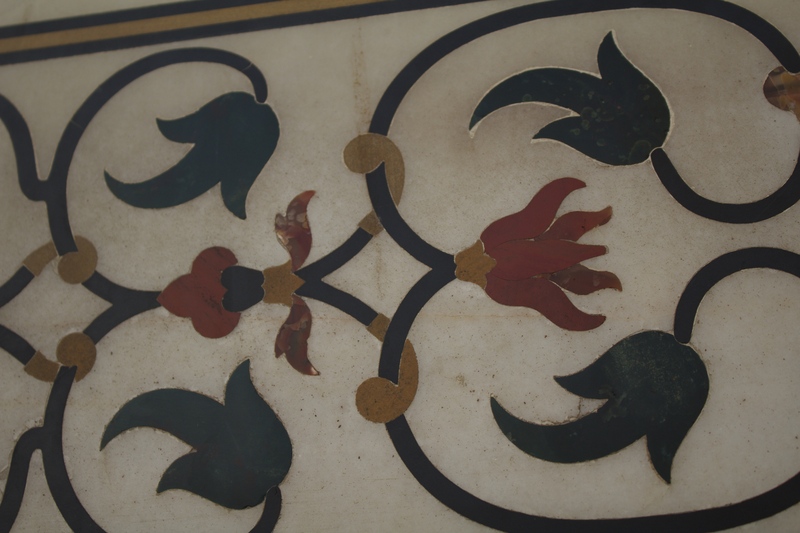 We later proceeded to tour benefited shop where fine marble inlay work by the ancestors of Taj construction workers(told so) is still being done. As expected pricey but definitely a place to buy souvenirs if bargained and the products look promising and reliable(so are till today). Later dinner at hotel and lights off. Agra fort is the home of Mughal Dynasty and another amazing land to experience the Indian history and the Kings life style in the earlier times. This fort witnessed many wars and was rebuilt parts of it many times to match the interests of the Kings. One can spend 2-3 hours at this site discovering the greatness of ancient history. On our way to Jaipur, we stopped at this beautiful city which was once capital city of Mughal Emperor – Akbar The Great. It is now one of the best illustration of Mughal architecture as it is a planned well built city with huge surrounding wall. It is one of the finest mosques ever built in India with white marble inlay touched with red sandstone finished with beautiful dome and it is perfect epitome of geometric patterns. 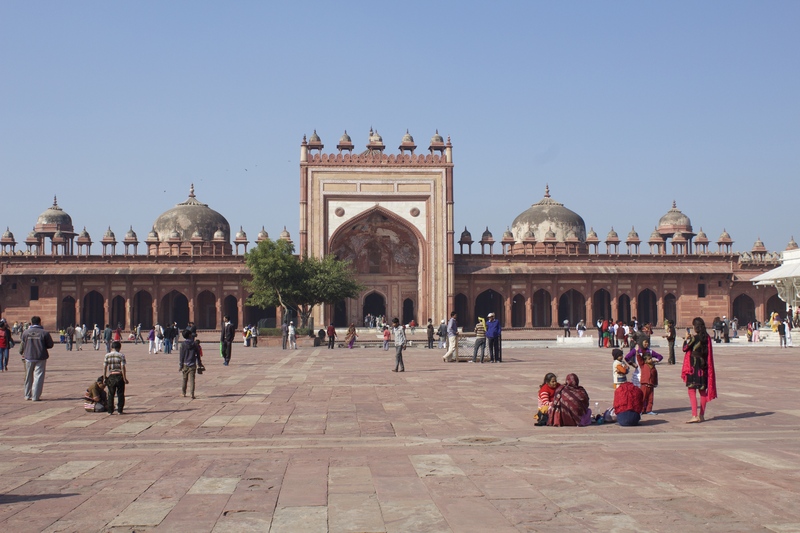 Salim Chisti is one highly regarded saint by Emperor Akbar and his tomb is built in the courtyard of Jama Masjid in a grand style with white marble and mosaic. It is a great structure to explore and understand the art of Mughal Empire. Panch Mahal, Hiran Minar are few others to admire in this gorgeous city but for us it’s time to hit Jaipur, the pink city of India. We had our lunch in yet another vegetarian restaurant in Jaipur with Dal bati churma, the authentic dish of Rajasthani cuisine. We headed straight to Jantar Mantar, the home of worlds largest stone sundial and we could feel the heat of Thar desert here. Jantar Mantar is an exceptional land of great innovations and instruments built using astronomy and ancient Hindu beliefs. This place has various instruments for measuring time, tracking stars, predicting eclipses all observations made from naked eye. One of the very interesting construction of ancient India which depicts the life of woman and the greatness of ancient Indian technology in a nutshell . This palace is merely built for Royal Women to enjoy the streets of Jaipur while unseen from outside and at the same time providing them cool breeze even in a scorching summer. Yet another architectural beauty from ancient India. This palace is built as a summer getaway for King Pratap Singh with a huge makeover in the lake Man Sagar itself. Well Indian Kings are definitely rich or let’s put it this way, they sure know to lead a luxury life, no exceptions. Later we visited a local Krishna Temple in which the idol faces the balcony of Kings Palace to let King and Queen directly pray daily. We were just on time for harathi and so the chants and prayers created a holy environment. Of course loud chants. We wanna end our day in a good relaxed style and Chouki Dhani theme resort just did that. You have your own space to enjoy Rajasthani favorite dishes while the open hub is accommodated with traditional dancers and musicians who perform live to entertain with various stunts and dances while you pick buffet. Pleasant experience! Lastly it’s Hotel Umaid Bhawan to rest after one hell of a day. Madan did amazing job taking us to right places on right times in our tight schedule. This hotel now is too good to just sleep. Pools, beautiful and colorful interior, grand King size bed, staff like personal maids, crystal chandeliers, true palace experience but before we realize, its already Good morning! Heavy delicious breakfast and we are on road already. Amer Fort is one must-see heritage site around Jaipur. It is an exceptional palace and fort sitting on a high hill, protected with a wall all around. Situated right above Maotha lake, it is considered as one of the most romantic palaces of India. 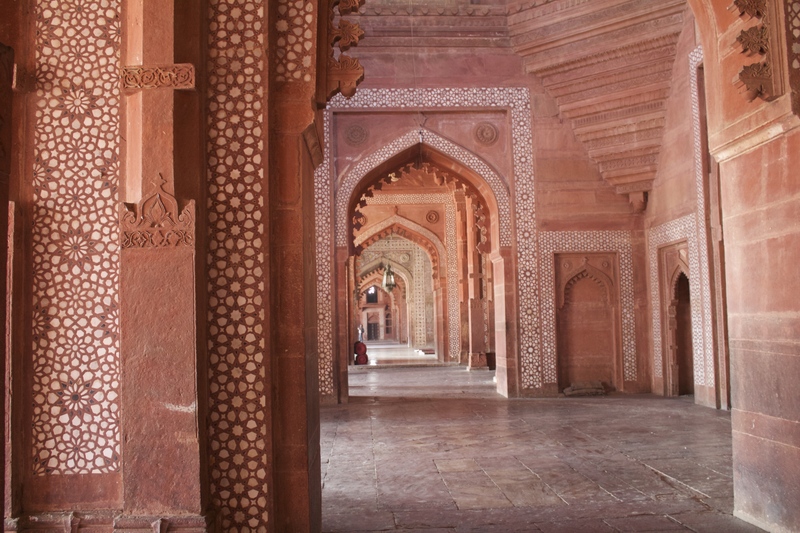 Constructed with red sand stone and white marble, this huge palace has four courtyards – One for public audience, other for private, another for King’s meetings and the last one for Royal Women specifically. The layout of the palace amuse us in every aspect of it. It is so flawless that King can travel from one courtyard to other in minutes thru passages without been seeing from anyone. The rooms are so big and well decorated with astonishing paintings and artwork sustained till date. Especially, the third courtyard – Sheesh Mahal is brilliant with hunting murals, mirror mosaics and exquisite colored glasses. These are extremely beautiful and at the some time, every part of it with a purpose either to illuminate the courtyard from the little reachable sun light and keeps the place cool by artificial winds. Just Amazing! Our hotel near Karol Bagh is pretty decent, quiet area and impressive service. Later that evening we explored Karol Bagh – a place to buy all gifts and materials to neighbors and relatives. Atleast my mother was happy. Golden rule: BARGAIN. Good morning Delhi! We are all excited to explore Delhi, the capital city of India with so much history behind it. We made our first stop at the historical site, the home of the mughal dynasty – Red Fort. The fort we have been watching on every Independence Day where the Prime Minister hoists the flag. Mahatma Gandhi memorial. Being Feb 1, after the memorial day, the place is still well decorated and clean, and children never stop to pay respects to the great father of nation. It’s time to indulge in spirituality and Swaminarayan Akshardham complex can never go wrong. It is the modern world majestic mandir. The carvings of deities,musicians,dancers,flora and fauna all around the temple are simply amazing and it just brings back the ancient art in this new era. The dome, exhibits, gardens and the water-light show are must watch. Note: No photography. It is a Triumphal arch and memorial to thousands of soldiers whose names are inscribed on this gigantic structure. The terrific atmosphere will stir a proud smile on every face. Salute to Martyrs. We took a quick peek around Indian Parliament and the place where we usually see noisy all the time on televisions is quiet that morning. Later we headed to Indira Gandhi memorial, the residence of late prime minister where she was assassinated. All the belongings of Indira Gandhi are well preserved and the tour around the house depicts the life of the lady distinctly. A UNESCO world heritage site built by Delhi Sultans dated back to 11th century cannot be missed. The tall tower built of red sandstone has 6 storeys in it a with spiral staircase. Numerous inscriptions all around the tower explains the history of the construction. We made our last stop at Lakshmi Narayan Temple also known as Birla Mandir of Delhi to satisfy the inner peace of my mother😄 It was one of the first Hindu temple built in Delhi and is among the major attractions in the capital city. One can spend weeks in Delhi learning the history and culture of India. It has people with various religions and possibly from every state in India. Local food is must try and streets are populated with thousands all the time. Our first visit to this great city is memorable and we can only wish to be on vacation forever. See you Delhi someother time! Thank you. Let me know if you need any help when you visit, I will be happy to provide more details if needed.